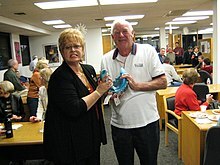 A man "steals" a gift in a white elephant gift exchange, while its previous owner is reluctant to relinquish it. A white elephant gift exchange, Yankee swap or Dirty Santa[nb 1] is a party game where amusing, impractical gifts are exchanged during festivities. Usually, the goal of a white elephant gift exchange is to entertain party-goers rather than to gain a genuinely valuable or highly sought-after item. The term white elephant refers to an extravagant, but impractical, gift that cannot be easily disposed of. The phrase is said to come from the historic practice of the King of Siam (now Thailand) giving rare albino elephants to courtiers who had displeased him, so that they might be ruined by the animals' upkeep costs. While the first use of this term remains a matter of contention among historians, one theory suggests that Ezra Cornell brought the term into the popular lexicon through his frequent social gatherings as early as 1828. Each participant supplies one wrapped gift, usually of similar value. The gifts are placed in a central location, and participants determine in which order they will take turns selecting them. The first person opens a wrapped gift, and the turn ends. On subsequent turns, each person has the choice to either unwrap a new present or to "steal" another's. When a person's gift is stolen, that person can either choose another wrapped gift to open or can steal from another player. To avoid never-ending circles, each gift can only be stolen once per turn. The game is over when everyone has a present. Generally, it is recommended to have at least six participants for the gift exchange party. With a larger group, game play may be more protracted. Originally, for many, a "White Elephant" gift exchange was different to a "Dirty Santa" gift exchange. While the rules for picking and "stealing" gifts were similar, the difference was in the type of gift that was brought by each player. Typically, a "White Elephant" gift was any item that the player had lying around the house, and would actually like to get rid of, or just a humorous, silly gift. This was in deference to the stories about a king giving a "worthless or not-so-desirable" gift, a.k.a. the "White Elephant". A "Dirty Santa" gift exchange was more of a reference to the method of play of the game, in which gifts were "stolen" after they had been received (picked). It is easy to see how the White Elephant type game began to be referred to as Dirty Santa as they were referring to the "method" of play, which became more of the focus, rather than the "type of gift" to be brought. For many, the distinction between the two games or labels has been lost or blurred. Since the process of stealing can prolong the game and can confer distinct disadvantages to certain places in the order of play, multiple variations have arisen. Since the first player is the only one without the option of seeing any unwrapped gifts, most variations allow this player to take one final turn after all gifts have been opened and swap with any "unfrozen" gift. A certain gift may be particularly sought after, prolonging the game (almost indefinitely). To address this, two related variations have been widely adopted: First, no gift may be stolen more than once per turn. However, this gives a distinct advantage to the final participant. Because of this, a second common variation states that after a gift has been stolen a certain number of times (usually three) it is "frozen" (or "dead" or "safe") and cannot be stolen again. Another version dictates that in order to steal a gift, the stealer has to take a shot of alcohol for every time the gift has already been stolen, including the current time. To speed up the multiple steals variant, there is often a certain number of steals allowed per turn. For example, after the third gift on a turn is stolen, the fourth player may be required to open a wrapped gift. An exception may be made for the last round (after all gifts have been opened), allowing an indefinite amount of swapping (see below). Most of the time, variants that allow multiple steals end without completing the game since it becomes too difficult to track the game context. Another popular variant no longer places a limit on the number of times a gift can be stolen but instead limits the number of times a person can be stolen from. Once the person reaches that number, the last gift they choose is automatically frozen to them. The frozen person can no longer be stolen from or steal from anyone else. The gifts themselves can circulate as often as possible unless frozen to someone, but a person cannot steal back the gift that was just taken from them. Another variation is to leave all the gifts wrapped until the end. Stealing is still allowed (up to a predefined number of times) but must be done while the gifts are still wrapped. In this case, there is no stealing after the wrapping comes off. Since only desirable gifts will be stolen, people with less desirable gifts may be essentially out of the game after opening one. One variation to rectify this is to allow no stealing during the opening of gifts but to have a subsequent stealing round in which the host secretly sets a timer, and everyone in the group takes turns trading their gifts with those of another. (Players may pass their turn.) This continues until the timer rings, at which time each player keeps what is in their hand. "The White Elephant Gift Exchange", an episode of the animated television show Regular Show, in which the park workers give Muscle Man a terrible gift after one too many pranks. ^ Other names include the Grinch Game, Thieving Elves, Snatchy Christmas Rat, Cutthroat Christmas, Redneck Santa, Machiavellian Christmas and Kamikaze Gift Exchange. ^ Nunez, Kirsten (2016-12-13). "What Is A White Elephant Gift Exchange? Here's What You Need To Know About This Entertaining Party Game". Bustle.com. Retrieved 2018-12-03. ^ Bologna, Caroline (2017-12-18). "Why Do We Call That Holiday Game Yankee Swap, White Elephant And Dirty Santa? Unpacking the history of the popular gift exchange game". Huffington Post. Retrieved 2018-12-03. ^ a b c d e McGough, Nellah Bailey (2017-12-07). "Dirty Santa Rules for Your Gift Exchange Party". Southern Living. Retrieved 2018-12-03. ^ Larsen, Derek; Watson, John J. (September 2001). "A guide map to the terrain of gift value". Psychology and Marketing. 18 (8): 889–906. doi:10.1002/mar.1034. Ruth, Julie; Otnes, Cele C.; Brunel, Frédéric F. (March 1999). "Gift Receipt and the Reformulation of Interpersonal Relationships". Journal of Consumer Research. 25 (4): 385–402. doi:10.1086/209546. Dryland, Ann (October 1968). "Review". British Journal of Educational Studies. 16 (3): 336–7. JSTOR 3119303.